There are some genres perfectly suited for the touchtastic talents of the DS. When it’s implemented properly, and not just shoehorned in for gimmickry’s sake, great things can happen. 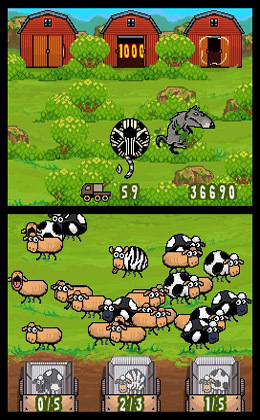 I didn’t know that ‘crazy arcade sheep-wrangling sim’ was a genre, but it’s a perfect example of this. feast your eyes, ears and assorted bodily orifices on QuickPick Farmer. This obscure little offering from Dancing Dots hit DSiWare in 2010. As the title suggests, it’s a game of quick stylus-sorting, in which sheep must be sheared and their wool dispatched in trucks as fast as possible. Which doesn’t sound all that exciting, but there’s more. 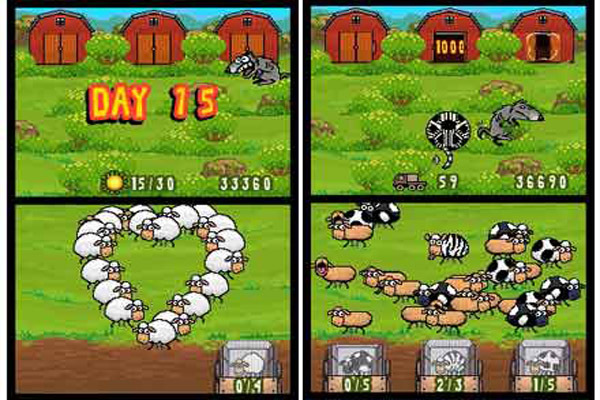 The sheep shuffle about on the bottom screen, stupidly and hairily as sheep are wont to do. Above them are the sheds, each of which only admit certain ‘varieties.’ From within the crowd of black sheep, white sheep, grey sheep and subtly-differently-spotted sheep, you must grab the appropriate ones and drag and drop them to their destination. Mistakes will cause time penalities, so you must be both fast and accurate. Yep, just an average day with QuickPick Farmer. There’s a further complication, in the form of an emaciated and really dumb-looking wolf. He is slowly but surely approaching the herd from the top screen, along a ‘path’ of bushes and such. If he reaches them, it’s an instant game over, but you’re able to defend yourself. When each shearing-batch is completed, you use the stylus to fire the wool ball catapult fashion into the waiting trucks. Timed correctly, you can instead opt to blast the wolf with it, which will knock it back along the path it’s following and buy you time. In this way, you have several different elements to manage, and a strict time limit for each. It’s all oddly strategic and hectic. That’s the beauty of QuickPick Farmer. As simplistic as the concept is, there’s a lot going on beneath the surface. It’s a brief experience, with only a series of main levels and a survival mode, but it’s rather compulsive. It also has that cheeky humorous spirit running throughout, which is great to see. Next article‘Mario Kart 8’ and the Koopaling Controversy: What Do You Think of the Roster?